Create pay stubs online quickly, easily and based on your convenience. Try Online Pay Stub right now and we are sure, we won’t disappoint you! Get Real check stubs within minutes and you will be ready to download. So, Start Now! What’s stopping you? 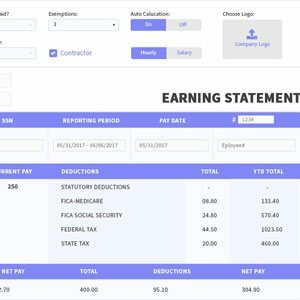 Enter your pay related information like company name, your name, YTD, SSN and others. Preview and pay for your pay check stub. Check your mail to view and download paystub. Generate your pay stubs online at Online Pay Stub to save your time and money with our automation tool. You will receive your Stubs in mail. Check your mail and download your paystub. You can share the paystub with your friends over internet or download it. You can resend order. In simple terms, Paystub is an on paper record of your paycheck provided along with each paycheck. Paystub or paycheck stub contains various details related to the paycheck. It mentions the amount which the employee earned and also states the deductions in forms of taxes, insurance, costs and others. Why you need a Paystub along with paycheck? A Paystub includes information which can be used by both the employee and the employer. Employee can use it as their record for their earnings. They can also get information regarding their net earnings and also deductions. This helps employees plan their income management smartly, secure loans from bank, credit card request and also investments. Employers need paycheck stubs to settle the discrepancies with their employee. Having record of paycheck tub help employee to solve any salary related issues from employee’s side. Thus paystub is important for both. For individual doing their own business, paystub help them know about their deductions and earnings which will help them in planning money smartly. Real Check Stubs: What information is contained? Net Pay: Net pay is the balance amount after taking out the taxes, deductions and contributions from gross pay. It is the amount which employees take home. How can Online Pay Stub Help me or my organization? As mentioned above, paystub is necessary with every paycheck. But, generating a paystub is not an easy task. It is very complex with number of calculations and deductions. Online Pay Stub comes in the picture here. It eases out all your calculation related work. You just need to mention the required details and our automated paycheck calculator will do the rest. As an organization, generating paystub for each employee manually I quite a task and requires investment in form of man power and other expense. Plus there are chances for human error. With Online Pay Stub, we eliminate the possibility of human error and save you from huge expense of installing software generating it. Here you need to pay online as per your use. We do the task for you and generate easy paystubs ready for print or download at very affordable rates. Then why wait? Create your first pay stub, Right Now! How can I get free printable pay stubs online from you? We are providing free printable pay stubs when you make check stub. If you are creating a paystub for the very first time with us, you chose to make more than one stubs at that time.